Yes, this is what I don’t understand either. With throttle and steering mixed by the skid steer config it’s not clear to me how this would work. OK, this might work. 1st set MOT_PWM_TYPE to (0) if it isn’t already. Then set the servo limits and trim as shown in the attached. Min and Trim to 1500 and max to 2000 or whatver the max is shown in the radio calibration screen. And again use a switch for arming not rudder stick. Thank you for the replies. Good morning. Once I’ll come back to home from uni, I’ll try this im the evening. Also, I was calibrating the compass with telemetry because i didn’t have such a long usb cable? 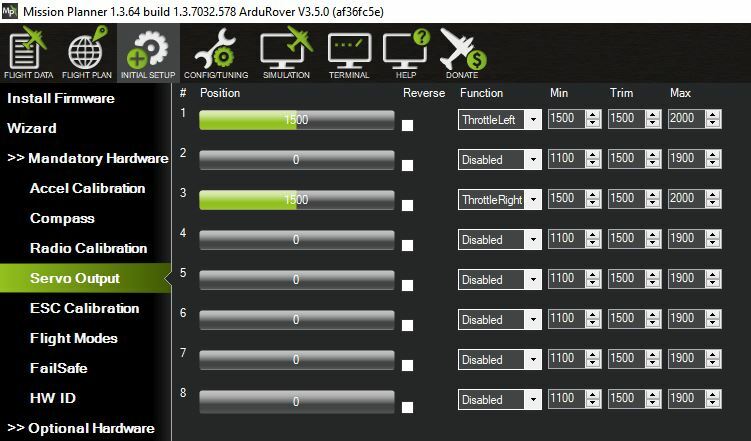 Can you refer me to a guide on how to do the settings on the rc radio. I want to make the 3 way switch to go in modes Auto Manual and Loiter. Since there are other switches i want to assign arm and disarm as well. Right and left stick to arm/disarm isn’t really great. Thank you. I’ll re calibrate stuff while esc’s are working (but motors unplugged). Boat is around 5kg and a meter long. It is really hard to fix it and click the button lol. I’ll dig the manual. I’m so new to the rc world. It is very complex. Thank you for the help. I’ll call the local rc shop to ask about a reverse capable shaft with props. Try to change them. I won’t use reverse and I’ll set min pwm to 1497. But having an option is nice. It may just make wider turns particularly when moving very slow. I would test this but my boat is halfway through a refit and not ready for the water yet. ESC’s are conencted to the pixhawk. Should i add to more cables from Rc receiver to Pix hawk for 2 motors? No. Sbus is carrying all channels. thanks. I will now recalibrate everything on the balcony with no electronics near by, over telemetry. Hello. I don’t know what i did wrong. I calibrated the external compass. At the outside the flash light is green. When moved indoors it says bad ahrs. problem is. Now no matter what i do, i can’t control the motors thru RC transmitter. I will take the boat to university tomorrow. Prof wants see my progress. And next week I’m supposed to go on a field test with Auto mode. I couldn’t test the boat on my bathroom for prop spin off test. Because i could’nt manipulate the esc’s with my Rc Transmitter. Is it armed and in manual? You may indoors get all sorts of problems with the compass and GPS. Yes. even if it’s fully on SAFE armed, RC sticks makes no movement. I can see the pwm signal on the radio section of the Mission Planner tho. 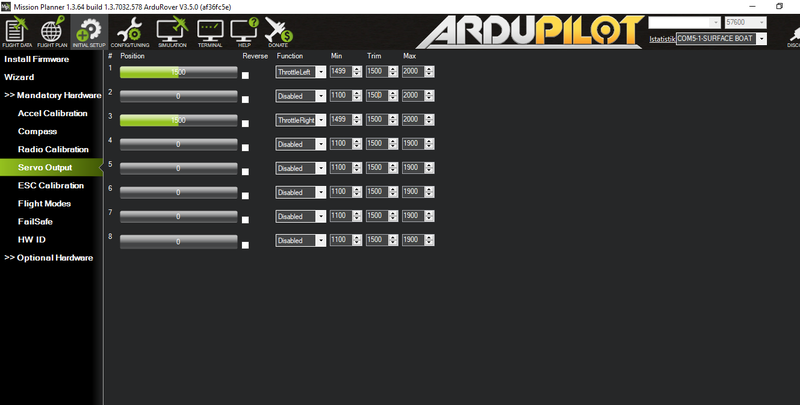 Yesterday i was able to control the servo outputs over my RC. Maybe i need to do some setup inside my RC radio? Btw in my thesis I’ll give credit to you and to Mr. Dave and Mr. RMackay! Because you really help me out! really you should not have to do any adjustments with the radio usually. You may want to try setting ARMING_REQUIRED to 0. BRD_PWM_COUNT is 2 and you are using outputs 1 and three so I don’t know if that is a problem. Cruise throttle , although not a problem for manual, is only 5. Thanks I’ll change them asap. I use 1 and 3 because of skid steering. yes. it works well in manual mode now. thanks. I’ll do the bath tube test now. Well I think this proves you were not arming the system before. That was kind of the purpose. Well it was arming. but now it is auto arming and i can’t disarm at all now. Prop test failed. when on reverse, props spin off. Problem 2: The shafts carry water in the boat. I think i should buy a brandnew set of sharft/prop that can do reverse and forward.